Apparently even Donald Trump knows there are some lines a major presidential candidate shouldn't cross. 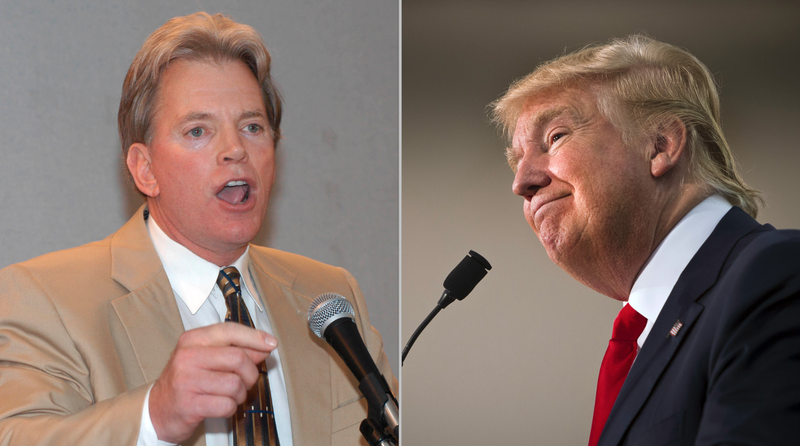 The billionaire businessman, who's currently leading the polls for the GOP nomination, was praised recently by David Duke, an infamous white supremacist who called the GOP frontrunner the "best of the lot" among presidential candidates. "Although we can't trust him to do what he says, the other Republican candidates won't even say what he says," Duke said last week on his radio show, according to Buzzfeed, praising Trump's outspoken opposition to illegal immigration. "So he's certainly the best of the lot. And he's certainly somebody that we should get behind in terms, ya know, raising the image of this thing." Trump was asked Wednesday about Duke's praise, and he distanced himself from the white supremacist. "I don't need his endorsement; I certainly wouldn't want his endorsement," Trump said during an interview with Bloomberg News on Wednesday. "I don't need anyone's endorsement." When he was asked whether he would flat-out reject Duke's support, Trump replied, "Sure, I would if that would make you feel better." He wasn't surprised by Duke's kind words, however. "A lot of people like me," Trump explained. "Republicans like me, liberals like me. Everybody likes me." Despite his praise for Trump, Duke has also voiced some reservations, saying the GOP frontrunner might be a bit too friendly with the "Jewish elite" for his taste. "Trump has made it very clear that he's 1,000 percent dedicated to Israel, so how much is left over for America?" Duke asked during an interview with the Daily Beast published Wednesday. In a Quinnipiac poll released Thursday, Trump continued to dominate the GOP field with 28 percent among Republican voters nationwide. Retired neurosurgeon Ben Carson was a distant second at 12 percent, and every other candidate was in the single digits.